The SV-350 Series has been discontinued. Please see the SV3500 Series as a possible alternative or contact our Flow Engineering Department. SV-350 Series 2-way solenoid valves are internally piloted valves with diaphragm and forced lifting which open fully from 0 PSI pressure differential. The valves feature brass or stainless steel body with high flow rates, FKM seal material, and a temperature range from -10 to 130°C (14 to 266°F). 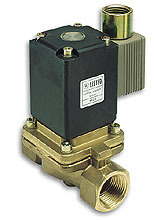 The valves are ideal for neutral media such as water, compressed air, and hydraulic oil (viscosity approx. 2.3 x 10 -4 ft 2 /sec). Electrical connection is by conduit plug. * The SV-359 is not UL listed.